What is the law of the law? What produces our craven subservience to linguistic norms, and our shocking indifference to the phenomenon of universal suffering? 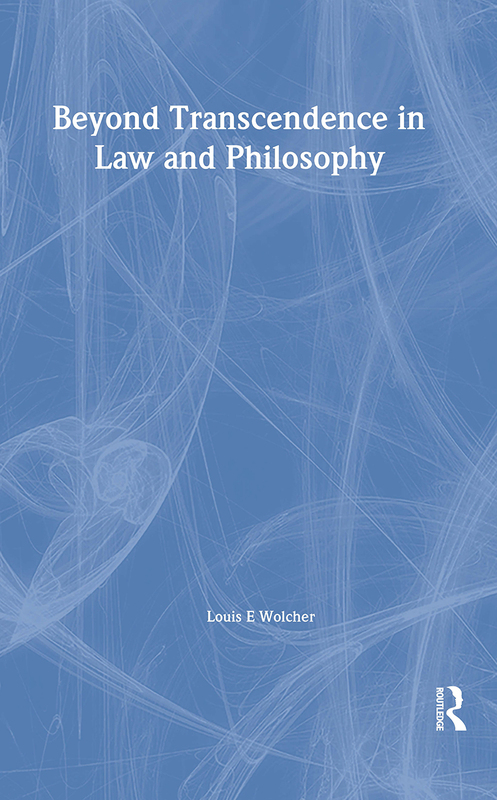 In a path-breaking new work of philosophy, Louis Wolcher seeks to answer these questions from the standpoint of Zen Buddhism. Bringing an Eastern sensibility into contact with three of the most important themes in Western philosophy, Beyond Transcendence in Law and Philosophy meticulously investigates three of the twentieth century's most important philosophers: Martin Heidegger - on being, Emmanuel Levinas - on ethics, and Ludwig Wittgenstein - on language. In the context of the larger Western obsession with transcending the ordinary, Louis Wolcher argues that the yearning for transcendence is born of the illusion that there is a fundamental difference between the ordinary and the profound. Employing Zen koans and stories to advance a 'deflationary' view of language and knowledge, he goes on to argue that the norms of transcendence to which we cling are not eternal truths but artefacts of desperate minds adrift on a sea of impermanence. What used to seem so majestically True, Right and Just thus shows itself to be utterly mundane: as merely true, right and just. What is left, however, is not nihilism - for clinging to a view of 'nothingness' is just as deluded as clinging to a view of 'somethingness' - but rather a new beginning of compassionate concern for the suffering of others. Beyond Transcendence in Law and Philosophy is a strikingly original synthesis of Eastern and Western thought. It will enlighten philosophers and legal theorists, as well as those who are interested in or open to the insights of Zen Buddhism. Birkbeck Law School has been recognised as an international centre of research excellence, specialising in legal theory and theoretically informed socio-legal research and pioneering critical approaches to scholarship. Birkbeck Law Press aims to develop a distinct publishing profile by addressing the legal challenges of late modernity. Globalisation and the move towards universal legal values, which should respect cultural specificities and local conditions, has created the urgent need for greater dialogue and understanding between the major schools of thought and legal systems in the world. Most legal publishing, driven by the needs of specialisation and the state-based nature of positive law, has not systematically addressed these concerns.